The next time you visit Indianapolis with your kids, you want to be certain that the whole family will have a great time. You probably also want to make sure that the activities you choose won’t break the bank. Here are a few budget and kid-friendly activities in Indianapolis that you can choose for an exciting day on the town. The Children’s Museum of Indianapolis is one of the best places in the city for families looking for a fun, budget-friendly time. Thanks to their new plan-ahead pricing plan, tickets are as low as $12 on certain days, and children ages 2 and under are always admitted for free. If you visit the museum on Thursday between 4 p.m. and 8 p.m., admission is only $5. While you’re at the Children’s Museum, you and your kids will enjoy a wide range of exciting, educational activities. 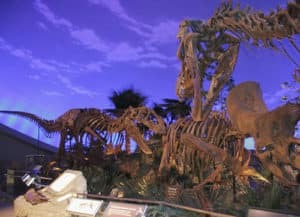 If your kids love dinosaurs, for example, you can head over to the Dinosphere and examine fossils of these prehistoric creatures. At the Beyond Spaceship Earth Exhibit, your children can take a tour of an International Space Station model and learn what it’s like to be an astronaut. If your family likes to stay active, it’s important to find an Indianapolis activity where you can burn some energy without burning a hole in your wallet. Luckily, at the Treehouse at Flat Fork Creek, you and your children can spend some time outdoors without spending any money. Flat Fork Creek is one of the newest parks in the city, and it features three tree houses that your children will absolutely love climbing. Once your kids reach the top of one of the tree houses, they can do a little exploring or tackle the obstacles set up along the walkway. Visiting the tree houses at Flat Fork Creek is a great way to have fun for free in Indianapolis. Do your kids have a love for animals? If so, then Nine Lives Cat Café is one of the best budget-friendly spots to visit for a good time. At Nine Lives, you can enjoy a hot cup of coffee, and your kids can spend some time playing with the friendly felines. Best of all, entry only costs $5 per person, per hour. For every three children under 12 years old, there must be at least one adult present, and all fees go toward caring for the cafe’s friendly cats. If you’re visiting Indianapolis with your kids in order to do a little sightseeing, Be sure to spend some time walking along the Cultural Trail. This 8-mile path connects the different districts of downtown Indianapolis, and it provides the perfect place for a relaxing stroll after a day of exploring the city. Lush plant life lines the trail, including trees and flowers, and will make it easy to see all of the most popular sights in downtown Indy. For affordable family fun, there’s almost no better city than Indianapolis. Visit any one of these spots to have a great time with your kids without having to spend a lot of money.